There’s no question that price is one of the biggest factors for drivers when deciding which car to book. At the same time, you want to earn as much as you can from renting out your car. 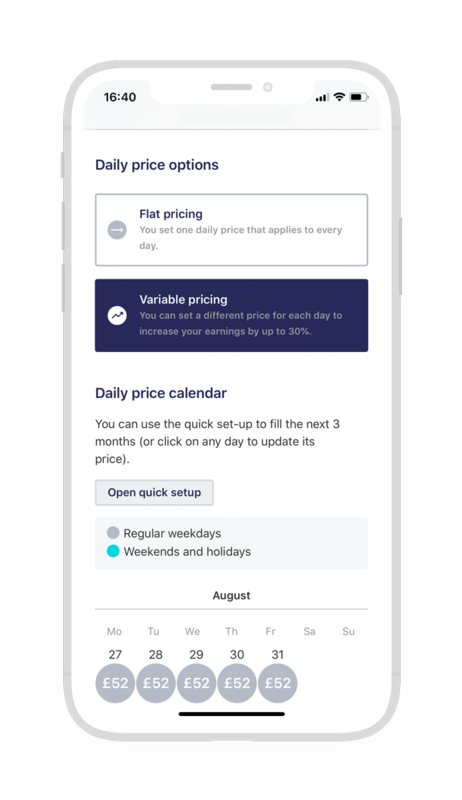 To find a price that’s not too high or too low, we’ve made it really easy for you to set fair prices on your listings - no economics degree necessary! To complete your listing, you’ll need to set a base price. Pick a price that drivers will have to pay per day to book your car. This is the price that will appear on your listing, so it’s important to set a daily price that earns you money but doesn’t turn off drivers. Don’t know what base price to set? Use our pre-filled suggested price to start. We calculate this price based on multiple factors, including the model and age of your car, and the prices of similar cars in the area. Pro tip: If you’re a new owner on Drivy, consider setting a base price that’s slightly lower than average to attract potential drivers, who usually prefer booking cars from owners who already have reviews. You can always increase your price later, once you’ve got a few good reviews under your belt. You also have the option to choose flat pricing or variable pricing. With flat pricing, your daily price stays the same for each day your car is available to book. With variable pricing, you can set different prices for different days. We highly recommend that you go with variable pricing because you can raise your prices on weekends and holidays when there’s high demand - and that can boost your earnings by up to 30%. We’ll use your base price to calculate a price structure that will help maximise your earnings. This takes into account length-of-trip discounts: the first day is the most expensive (to ensure the rental is worth it), then the price gets reduced for longer rentals to stay competitive. The longer the trip, the better value for the driver. We’ll also use your base price to calculate the price for 4-hour bookings. To book your car for a short trip under 4 hours, drivers will pay 70% of your daily price (for insurance reasons, it can't go below a certain threshold). The Drivy service fee is 21% of the price you set. This fee helps us run the platform and improve the experience for owners and drivers. The driver will pay for insurance and a booking fee of £3 separately.